A motorcycle helmet is a type of helmet (protective headgear) used by motorcycle riders. The primary goal of a motorcycle helmet is motorcycle safety - to protect the rider's head during impact, thus preventing or reducing head injury and saving the rider's life. 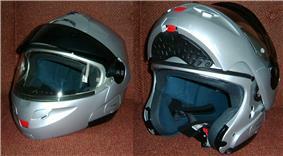 Some helmets provide additional conveniences, such as ventilation, face shields, ear protection, intercom etc. Motorcyclists are at high risk in traffic crashes. A 2008 systematic review examined studies on motorcycle riders who had crashed and looked at helmet use as an intervention. The review concluded that helmets reduce the risk of head injury by around 69% and death by around 42%. Although it was once speculated that wearing a motorcycle helmet increased neck and spinal injuries in a crash, recent evidence has shown the opposite to be the case, that helmets protect against cervical spine injury, and that an often-cited small study dating to the mid-1980s, "used flawed statistical reasoning". The origins of the crash helmet date back to the Brooklands race track in early 1914 where the medical officer, a Dr Eric Gardner, noticed he was seeing a motor cyclist with head injuries about every 2 weeks. He got a Mr Moss of Bethnal Green to make canvas and shellac helmets stiff enough to stand a heavy blow and smooth enough to glance off any projections it encountered. He presented the design to the Auto-Cycle Union where it was initially condemned, but they later converted to the idea and made them compulsory for the 1914 Isle of Man TT races, although there was resistance from riders. Gardner took 94 of these helmets with him to the Isle of Man, and one rider who hit a gate with a glancing blow was saved by the helmet. Dr Gardner received a letter later from the Isle of Man medical officer stating that after the T.T. they normally had "several interesting concussion cases" but that in 1914 there was none. In May 1935, T. E. Lawrence (known as Lawrence of Arabia) had a crash on a Brough Superior SS100 on a narrow road near his cottage near Wareham. The accident occurred because a dip in the road obstructed his view of two boys on bicycles. Swerving to avoid them, Lawrence lost control and was thrown over the handlebars. He was not wearing a helmet, and suffered serious head injuries which left him in a coma; he died after six days in hospital. One of the doctors attending him was Hugh Cairns, a neurosurgeon, who after Lawrence's death began a long study of what he saw as the unnecessary loss of life by motorcycle despatch riders through head injuries. Cairns' research led to the increased use of crash helmets by both military and civilian motorcyclists. There are five basic types of helmets intended for motorcycling, and others not intended for motorcycling but which are used by some riders. All of these types of helmets are secured by a chin strap, and their protective benefits are greatly reduced, if not eliminated, if the chin strap is not securely fastened so as to maintain a snug fit. The motocross and off-road helmet has clearly elongated chin and visor portions, a chin bar, and partially open face to give the rider extra protection while wearing goggles and to allow the unhindered flow of air during the physical exertion of this type of riding. The visor is to allow the rider to dip his or her head and provide further protection from flying debris during off road riding. It will also keep the sun out of the eyes of the rider during jumps. Originally, off-road helmets did not include a chin bar, with riders using helmets very similar to modern open face street helmets, and using a face mask to fend off dirt and debris from the nose and mouth. Modern off-road helmets include a (typically angular, rather than round) chin bar to provide some facial impact protection in addition to protection from flying dirt and debris. When properly combined with goggles, the result provides most of the same protective features of full face street helmets. A hybrid between full face and open face helmets for street use is the modular or "flip-up" helmet, also sometimes termed "convertible" or "flip-face". When fully assembled and closed, they resemble full face helmets by bearing a chin bar for absorbing face impacts. Its chin bar may be pivoted upwards (or, in some cases, may be removed) by a special lever to allow access to most of the face, as in an open face helmet. The rider may thus eat, drink or have a conversation without unfastening the chinstrap and removing the helmet, making them popular among motor officers. It is also popular with people who use eyeglasses as it allows them to fit a helmet without removing their glasses. Many modular helmets are designed to be worn only in the closed position for riding, as the movable chin bar is designed as a convenience feature, useful while not actively riding. The curved shape of an open chin bar and face shield section can cause increased wind drag during riding, as air will not flow around an open modular helmet in the same way as a three-quarters helmet. Since the chin bar section also protrudes further from the forehead than a three-quarters visor, riding with the helmet in the open position may pose increased risk of neck injury in a crash. Some modular helmets are dual certified as full face and open face helmet. The chin bar of those helmets offer real protection and they can be used in the "open" position while riding. An example of such a helmet would be the Shark Evoline. As of 2008, there have not been wide scientific studies of modular helmets to assess how protective the pivoting or removable chin bars are. Observation and unofficial testing suggest that significantly greater protection exists beyond that for an open face helmet, and may be enough to pass full-face helmet standardized tests, but the extent of protection is not fully established by all standards bodies. The DOT standard does not require chin bar testing. The Snell Memorial Foundation recently certified a flip-up helmet for the first time. ECE 22.05 allows certification of modular helmets with or without chin bar tests, distinguished by -P (protective lower face cover) and -NP (non-protective) suffixes to the certification number, and additional warning text for non-certified chin bars. The open face, or "three-quarters", helmet covers the ears, cheeks, and back of the head, but lacks the lower chin bar of the full face helmet. Many offer snap-on visors that may be used by the rider to reduce sunlight glare. An open face helmet provides the same rear protection as a full face helmet, but little protection to the face, even from non-crash events. Bugs, dust, or even wind to the face and eyes can cause rider discomfort or injury. As a result, it is not uncommon (and in some U.S. states, is required by law) for riders to wear wrap-around sunglasses or goggles to supplement eye protection with these helmets. Alternatively, many open face helmets include, or can be fitted with, a face shield, which is more effective in stopping flying insects from entering the helmet. 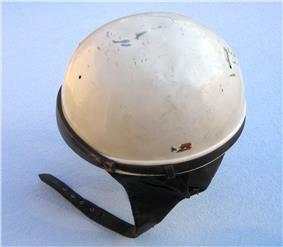 The half helmet, also referred to as a "Shorty" in the USA and "Pudding Basin" or TT helmet in the UK  and popular with Rockers and road racers of the 1960s in the British Isles. It has essentially the same front design as an open face helmet but without a lowered rear in the shape of a bowl. The half helmet provides the minimum coverage generally allowed by law in the USA, and British Standards 2001:1956. 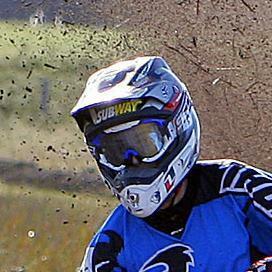 As with the open face, it is not uncommon to augment this helmet's eye protection through other means such as goggles. Because of their inferiority compared to other helmet styles, some Motorcycle Safety Foundations prohibit the use of half helmets now. Notable UK manufacturers included Everoak, Chas Owens and, currently, Davida. There are other types of headwear often called "beanies," "brain buckets", or "novelty helmets", a term which arose since they cannot legally be called motorcycle helmets. These helmets are not certified and are generally only used to provide the illusion of compliance with mandatory helmet laws. Such items are often smaller and lighter than helmets made to DOT standards, and are unsuitable for crash protection because they lack the energy-absorbing foam that protects the brain by allowing it to come to a gradual stop during an impact. A "novelty helmet" can protect the scalp against sunburn while riding and - if it stays on during a crash - might protect the scalp against abrasion, but it has no capability to protect the skull or brain from an impact. Although black helmets are popular among motorcyclists, one study determined they offer the least visibility to motorists. Riders wearing a plain white helmet rather than a black one were associated with a 24% lower risk of suffering a motorcycle accident injury or death. This study also notes "Riders wearing high visibility clothing and white helmets are likely to be more safety conscious than other riders." However, the MAIDS report did not back up the claims that helmet color makes any difference in accident frequency, and that in fact motorcycles painted white were actually over-represented in the accident sample compared to the exposure data. While recognizing how much riders need to be seen, the MAIDS report documented that riders' clothing usually fails to do so, saying that "in 65.3% of all cases, the clothing made no contribution to the conspicuity of the rider or the PTW [powered two-wheeler, i.e. motorcycle]. There were very few cases found in which the bright clothing of the PTW rider enhanced the PTW’s overall conspicuity (46 cases). There were more cases in which the use of dark clothing decreased the conspicuity of the rider and the PTW (120 cases)." The MAIDS report was unable to recommend specific items of clothing or colors to make riders better seen. Modern helmets are constructed from plastics. Premium price helmets are made with fiberglass reinforced with Kevlar or carbon fiber. They generally have fabric and foam interiors for both comfort and protection. Motorcycle helmets are generally designed to distort in a crash (thus expending the energy otherwise destined for the wearer's skull), so they provide little protection at the site of their first impact, but continued protection over the remainder of the helmet. Helmets are constructed from an inner EPS “Expanded Polystyrene foam” and an outer shell to protect the EPS. The density and the thickness of the EPS is designed to cushion or crush on impact to help prevent head injuries. Some manufacturers even offer different densities to offer better protection. The outer shell can be made of plastics or fiber materials. Some of the plastics offer very good protection from penetration as in lexan (bulletproof glass) but will not crush on impact, so the outer shell will look undamaged but the inner EPS will be crushed. Fiberglass is less expensive than lexan but is heavy and very labor-intensive. Fiberglass or fiber shells will crush on impact offering better protection. Some manufacturers will use Kevlar or carbon fiber to help reduce the amount of fiberglass but in the process it will make the helmet lighter and offer more protection from penetration but still crushing on impact. But this can be very expensive. to provide structure to the inner liner so it does not disintegrate upon abrasive contact with pavement. This is important because the foams used have very little resistance to penetration and abrasion. The purpose of the foam liner is to crush during an impact, thereby increasing the distance and period of time over which the head stops and reducing its deceleration. To understand the action of a helmet, it is first necessary to understand the mechanism of head injury. The common perception that a helmet's purpose is to save the rider's head from splitting open is misleading. Skull fractures are usually not life-threatening unless the fracture is depressed and impinges on the brain beneath and bone fractures usually heal over a relatively short period. Brain injuries are much more serious. They frequently result in death, permanent disability or personality change and, unlike bone, neurological tissue has very limited ability to recover after an injury. Therefore, the primary purpose of a helmet is to prevent traumatic brain injury while skull and face injuries are a significant secondary concern. The most common type of head injury in motorcycle accidents is closed head injury, meaning injury in which the skull is not broken as distinct from an open head injury like a bullet wound. Closed head injury results from violent acceleration of the head, which causes the brain to move around inside the skull. During an impact to the front of the head, the brain lurches forwards inside the skull, squeezing the tissue near the impact site and stretching the tissue on the opposite side of the head. Then the brain rebounds in the opposite direction, stretching the tissue near the impact site and squeezing the tissue on the other side of the head. Blood vessels linking the brain to the inside of the skull may also break during this process, causing dangerous bleeding. Another hazard, susceptibility of the brain to shearing forces, plays a role primarily in injuries that involve rapid and forceful movements of the head, such as in motor vehicle accidents. In these situations rotational forces such as might occur in whiplash-type injuries are particularly important. These forces, associated with the rapid acceleration and deceleration of the head, are smallest at the point of rotation of the brain near the lower end of the brain stem and successively increase at increasing distances from this point. The resulting shearing forces cause different levels in the brain to move relative to one another. This movement produces stretching and tearing of axons (diffuse axonal injury) and the insulating myelin sheath, injuries which are the major cause of loss of consciousness in a head trauma. Small blood vessels are also damaged causing bleeding (petechial hemorrhages) deep within the brain. It is important that the liner in a motorcycle helmet is soft and thick so the head decelerates at a gentle rate as it sinks into it. The helmet quickly becomes impractical if the liner is more than 1–2 inches (2.5–5.1 cm) thick. This implies a limit to how soft the liner can be. If the liner is too soft, the head will crush it completely upon impact without coming to a stop. Outside the liner is a hard plastic shell and beyond that is whatever the helmet is hitting, which is usually an unyielding surface, like concrete pavement. Consequently, the head cannot move any further, so after crushing the liner it comes suddenly to an abrupt stop, causing high accelerations that injure the brain. Therefore, an ideal helmet liner is stiff enough to decelerate the impacting head to an abrupt stop in a smooth uniform manner just before it completely crushes the liner and no stiffer. The required stiffness depends on the impact speed of the head, which is unknown at the time of manufacture of the helmet. 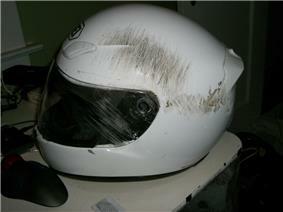 The result is that the manufacturer must choose a likely speed of impact and optimize the helmet for that impact speed. If the helmet is in a real impact that is slower than the one for which it was designed, it will still help but the head will be decelerated a little more violently than was actually necessary given the available space between the inside and outside of the helmet, although that deceleration will still be much less than what it would have been in the absence of the helmet. If the impact is faster than the one the helmet was designed for, the head will completely crush the liner and slow down but not stop in the process. When the crush space of the liner runs out, the head will stop suddenly which is not ideal. However, in the absence of the helmet, the head would have been brought to a sudden stop from a higher speed causing more injury. Still, a helmet with a stiffer foam that stopped the head before the liner crush space ran out would have done a better job. So helmets help most in impacts at the speeds they were designed for, and continue to help but not as much in impacts that are at different speeds. In practice, motorcycle helmet manufacturers choose the impact speed they will design for based on the speed used in standard helmet tests. Most standard helmet tests use speeds between 4 and 7 m/s (8.9 and 15.7 mph; 14 and 25 km/h). 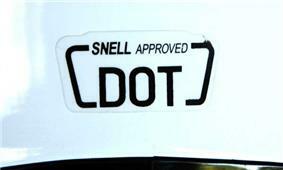 Snell-and-DOT decal on an HJC motorcycle helmet in the U.S.
Motorcycle helmets greatly reduce injuries and fatalities in motorcycle accidents, thus many countries have laws requiring acceptable helmets to be worn by motorcycle riders. These laws vary considerably, often exempting mopeds and other small-displacement bikes. In some countries, most notably the USA and India, there is some opposition to compulsory helmet use (see Helmet Law Defense League); not all USA states have a compulsory helmet law. The Snell Memorial Foundation has developed stricter requirements and testing procedures for motorcycle helmets with racing in mind, as well as helmets for other activities (e.g. drag racing, bicycling, horseback riding), and many riders in North America consider Snell certification a benefit when considering buying a helmet while others note that its standards allow for more force (g's) to be transferred to a rider's head than the U.S. Department of Transportation (DOT) standard. However, the DOT standard does not test the chin bar of helmets with them, while the Snell (and ECE) standards do. 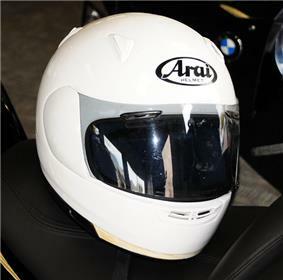 In the United Kingdom, many riders choose helmets bearing an Auto-Cycle Union (ACU) Gold sticker as it defines a stricter standard than the legal minimum ECE 22.05 specification. Helmets with an ACU Gold sticker are the only ones allowed to be worn in competition, or at track days. Most motorcycle helmet standards use impacts at speeds between 4–7 m/s (9–16 mph). 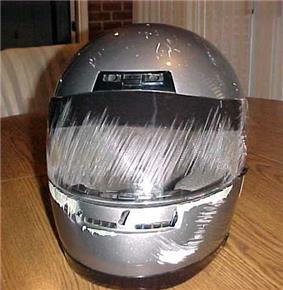 While motorcyclists frequently ride at speeds higher than 20 m/s (45 mph), the perpendicular impact speed of the helmet is usually not the same as the road speed of the motorcycle, and the severity of the impact is determined not only by the speed of the head but also by the surface it hits and the angle of impact. Since the surface of the road is almost parallel to the direction a motorcyclist moves while driving, only a small component of their velocity is directed perpendicularly (though other surfaces may be perpendicular to the motorcyclist's velocity, such as trees, walls, and the sides of other vehicles). The severity of an impact is also influenced by the nature of the surface struck. The sheet metal wall of a car door may bend inwards to a depth of 7.5–10 cm (3.0–3.9 in) during a helmeted-head impact, allowing more stopping distance for the rider's head than the helmet itself. A perpendicular impact against a flat steel anvil at 5 m/s (11 mph) may be of approximate severity to an oblique impact against a concrete surface at 30 m/s (67 mph) or a perpendicular impact against a sheet metal car door or windscreen at 30 m/s. Since there is a wide range of severity in the impacts that could happen in a motorcycle accident, some will be more severe than the impacts used in the standard tests and some will be less. ^ Liu, B. C.; Ivers, R.; Norton, R.; Boufous, S.; Blows, S.; Lo, S. K. (2008). Liu, Bette C, ed. "Helmets for preventing injury in motorcycle riders". The Cochrane Library (1): CD004333. ^ Paul Harvey, The Rest of the Story, KGO 810AM, August/September 2006. ^ "Seven Flip-Face Motorcycle Helmets Compared". Motorcycle Cruiser. Retrieved 19 September 2008. ^ "Zeus ZS3000 Review". WebBikeWorld (webWorld International). 2009. ^ "Why won't Snell certify some types of helmets like flip up front designs?". FAQs about Snell and Helmets. Snell Memorial Foundation. Retrieved 19 September 2008. 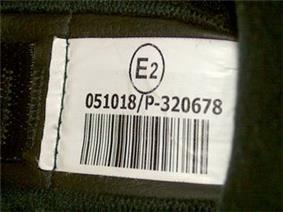 ^ "ECE 22.05 Motorcycle Helmet Standard, revision 2" (PDF). Economic Commission for Europe. 16 October 1995. pp. subsection 5.1.4.1.2.1. Retrieved 19 September 2008. ^ "ECE 22.05 Motorcycle Helmet Standard, revision 2" (PDF). Economic Commission for Europe. 16 October 1995. pp. subsection 14.1. Retrieved 19 September 2008. ^ "Standard No. 218; Motorcycle helmets" (PDF). Code of Federal Regulations, Title 49, section 571.218. National Highway Traffic Safety Administration. 1 October 2007. Retrieved 19 September 2008. ^ "ECE Regulation 22: Protective Helmets and their visors for drivers and passengers of motor cycles and mopeds" (PDF). Economic Commission for Europe. 20 February 2002. Retrieved 9 May 2012. ^ Dexter Ford (June 2005). "Motorcycle Helmet Performance: Blowing the Lid Off". ^ "Standard No. 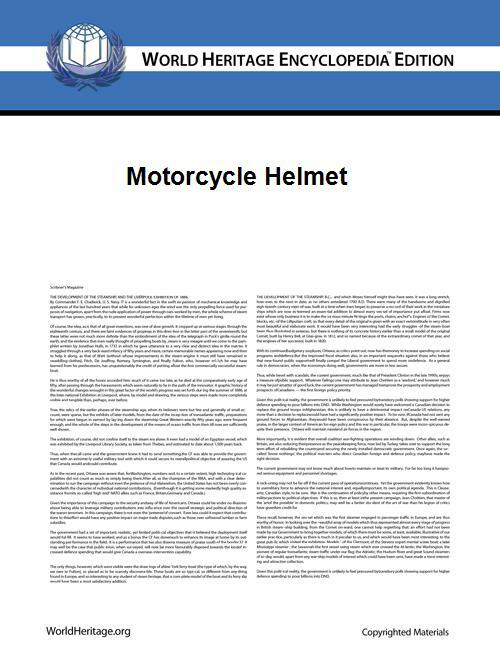 218; Motorcycle helmets" (PDF). Code of Federal Regulations, Title 49, section 571.218. National Highway Traffic Safety Administration. 1 October 2007. pp. subsection S6.2.3. Retrieved 19 September 2008. Ford, Dexter (September 2009). 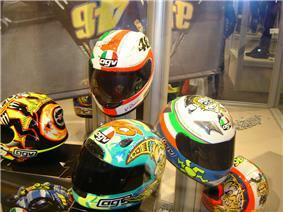 "Sorting Out Differences in Helmet Standards".